Communications Planning – We can help refine your perception of key messages and audiences. We can help you select some good communications channels and lay out a program schedule. We can also do follow-up surveys to see how things are going, and report on the results. Copywriting & Editing – This is a foundation service for Knowledge Street. It’s available as a standalone but also finds its way into everything. We’ve written or edited the copy for many, many websites, as well as our own. You can see more writing work in our monthly newsletter, Directions. Try a subscription – it’s free! Animations and Screen Capture – Computer screens, whether desktop or mobile, have become a primary channel for information delivery. We can develop anything from brief marketing pieces to full-blown training programs, incorporating music, narration and special effects, as appropriate. 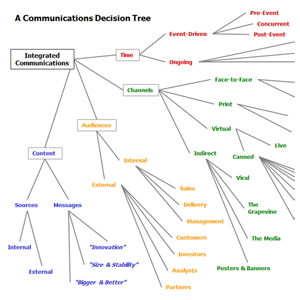 Delivering a message effectively is a matter of blending various elements, and we’ve evolved a Communications Decision Tree to help visualize this idea. Its branches present the content audiences, and delivery channels as well as the fact that messages themselves need to be considered over time. Show me. When it comes to communication, people just love video. 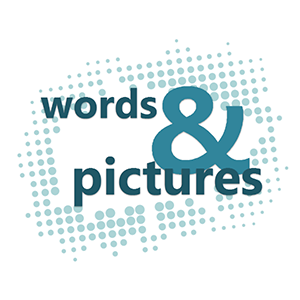 And when you take the right words and pictures, then add movement and music and narration, you can present something that's more compelling than any static material could ever be. If you have a story to tell, think about the video options. Show me.